Are you a Leadership Miami alumnus? Let us know. Posted on July 23, 2018 at 1:42 pm. 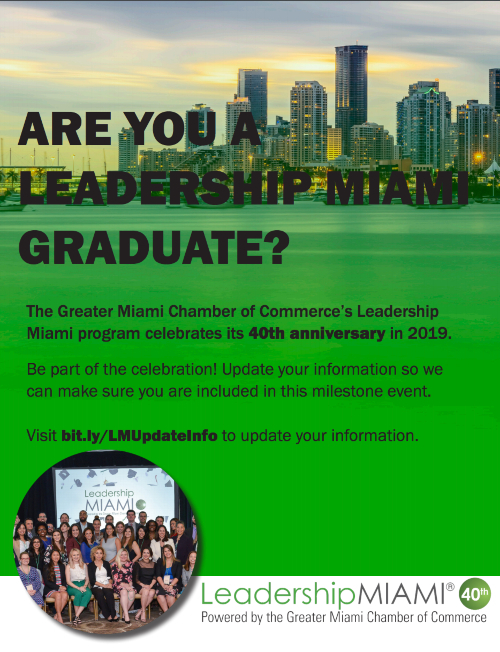 The Greater Miami Chamber of Commerce’s Leadership Miami program celebrates its 40th anniversary in 2019. We’re making a call to all FIU alumni who have participated in Leadership Miami since the program began: We want to hear from you! Share your personal experience in the program and a photo of yourself or your cohort for a chance to be featured in a future story about FIU alumni who participated in Leadership Miami.